The Medibank Feel Good program of free fitness classes is back for spring at South Bank Parklands. 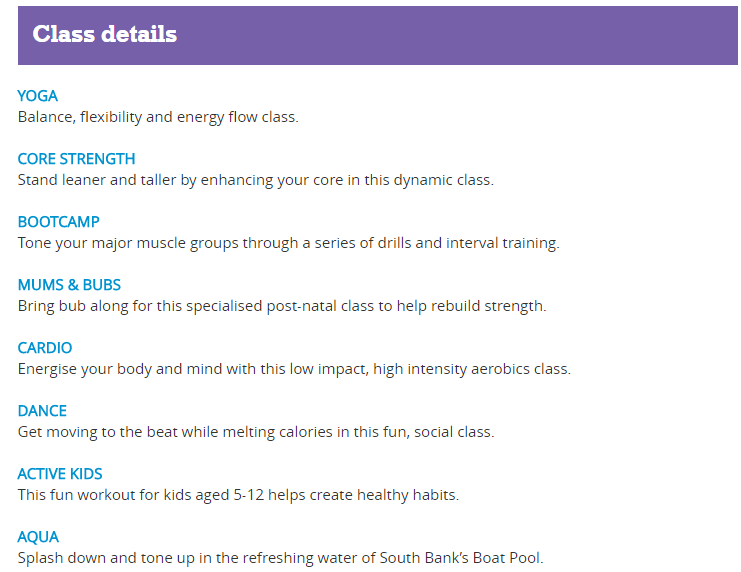 Recommencing on Monday 2 October, this season's offering of 45-minute fitness classes includes yoga, core strength, dance, cardio, and mums & bubs yoga on the lawns as well as aqua in the Boat Pool. A new Wednesday early morning Boot Camp class has been added to the program, plus an Active Kids session on Saturdays, designed for school-aged kids with energy to burn. Bring a towel, water bottle and a workout buddy to the class that suits your fitness goals - no bookings are required and it's all free. All classes are run by qualified instructors from Goodlife Health Clubs. Below you will find this seasons timetable of classes and a short description of each class. All classes are located on the Little Stanley Street Lawn, except for Aqua, which is in the Boat Pool. I'm thinking I would like to try Saturday morning yoga, let me know below which class you would like to try.